The FMA219 is a 2-stage, reactively matched pHEMT low-noise MMIC Amplifier designed for use over 7.0 to 11.0 GHz. The Amplifier requires a single +3V supply and one off-chip component for supply de-coupling. Both the input and output ports are DC de-coupled. Grounding of the Amplifier is provided by plated thru-vias to the bottom of the die, no additional ground is required. The Amplifier is unconditionally stable over all load states (-45 to +85C), and conditionally stable if the input port is open-circuited. 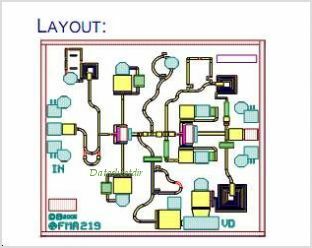 This is one package pinout of FMA219,If you need more pinouts please download FMA219's pdf datasheet. FMA219 circuits will be updated soon..., now you can download the pdf datasheet to check the circuits!